The bedrock beneath Cape Cod, Massachusetts is overlain by a thick sequence of late Quaternary glacial and coastal deposits. The composition and character of the bedrock provide information about the evolution of the eastern North American continental margin. Unfortunately, no known bedrock outcrops have been mapped east of Plymouth and Marion, Massachusetts (Weed, 1991). For the first time, bedrock cores have been collected from western Cape Cod as part of the Installation Restoration Program (IRP) at the Massachusetts Military Reservation (MMR). This report describes the bedrock petrology from 64 well sites drilled between 1998 and 2002 and presents photographs that visually document 57 of the bedrock cores. The discovery of soil and groundwater contamination due to military activities at the MMR in western Cape Cod led to the initiation of the IRP in 1982. Designated a Superfund site in 1989, the MMR and surrounding communities have been subject to in-depth hydrogeologic studies identifying 13 separate contamination plumes (U.S. Army Environmental Center). As a part of these studies, thousands of wells have been drilled for monitoring and remediation purposes on and adjacent to the reservation, some penetrating into bedrock. Cores from the IRP wells provide useful information concerning the thickness of the overlying Quaternary deposits, the nature of the sediment-rock interface, and the topography of the bedrock surface. Cores collected as part of drilling operations both on and off the military reservation also provide information about the bedrock lithologies and their distribution beneath this portion of Cape Cod. The majority of the basement beneath southeastern New England is composed of a series of terranes, including the Merrimack, Nashoba, Avalon, and possibly the Meguma, that were accreted from the southeast during the Paleozoic (Skehan, 1997). Intrusive rocks associated with terrane accretion and orogenesis, as well as post-Paleozoic basin-filling sedimentary rocks make up the rest of the bedrock in this region. Underlying most of Rhode Island and eastern Massachusetts, possibly including Cape Cod, is the Avalon composite terrane, composed mainly of granitoids, gneisses, and schists, which are partially concealed beneath the Late Paleozoic Narragansett and Boston basins. The Avalonian crystalline rock of southeastern Massachusetts and northeastern Rhode Island is referred to as the Milford-Dedham zone. This region is dominated by the expansive granitic Dedham batholith and Fall River pluton (both Proterozoic Z), the Devonian Scituate granite, and the Milford and New Bedford gneissic terranes (both Proterozoic Z). Smaller concentrations of Paleozoic intrusive rocks within the Milford-Dedham zone are located north and west of the Narragansett basin (Hermes and Zartman, 1992; Wones and Goldsmith, 1991). Regional metamorphism and deformational histories are poorly understood. Metamorphic events probably occurred in the Proterozoic as well as during the Permian Alleghenian orogeny. Regional metamorphism associated with the Alleghenian orogeny affected both the basement and the Carboniferous sediments of the Narragansett basin (Zartman and Naylor, 1984). The regional metamorphic gradient of southeastern Massachusetts is complicated, and begins with greenschist facies north of the Narragansett basin, increasing southward to reach amphibolite facies within the basin. Continuing south, the metamorphic grade then decreases again to greenschist facies in the Fall River pluton, only to increase to the amphibolite facies gneisses of New Bedford (Murray and others, 1990). Plutonic rocks in southeastern Massachusetts are generally weakly deformed, and deformation is generally limited to brittle deformation seen in fault zones. Fracturing and hydrothermal alteration is common in the Dedham batholith, resulting in the presence of secondary chlorite and epidote. The New Bedford gneisses show east-west trending subvertical foliations, while schistosities in the Narragansett basin rocks trend north-south. The tectonism that resulted in this deformation is not clearly understood, yet much of it is likely associated with the Alleghenian orogeny (Murray and others 1990). The tectonic setting of the basement rocks beneath Cape Cod is subject of some controversy. Some workers suggest that the basement is entirely of the Avalon terrane (Hutchinson and others, 1988; Leo and others, 1993). The Nauset magnetic anomaly that crosscuts Cape Cod (study location map) is suggested to be related to a transition between central and southern plutonic zones of the Avalon terrane by Hutchinson and others (1988) and Leo and others (1993). Others suggest that the Meguma terrane, which is exposed to the northeast, across the Gulf of Maine in Nova Scotia, may underlie southeastern Cape Cod (Skehan, 1997). In this case, the Nauset magnetic anomaly described by Hutchinson and others (1988) is suggested as the Avalon-Meguma terrane boundary. Suturing would have occurred in the Permian, possibly resulting in the deformation of the New Bedford gneisses and/or the Narragansett basin rocks. 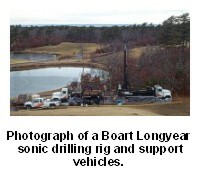 Rotary sonic drill rigs were used to extract the bedrock cores. 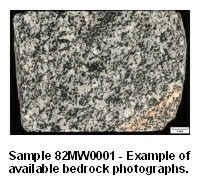 Bedrock surface elevations (see Data Catalog) were determined from data collected during drilling operations. Cores were cut to cm-thick slabs using a standard masonry saw. Sections were cut, whenever possible, normal to any foliation and parallel to any mineral lineation. Slabs were then scanned with an Epson Expression 836XL scanner to create high-resolution digital images. Thin sections of 52 samples were examined and 12 were photographed using transmitted light on a petrographic microscope mounted with a digital camera. Thin sections were partially stained for both K-feldspar and plagioclase. Modal percentages were determined by visually estimating the cumulative area of each mineral identified in thin section, across the entire thin section area. Errors associated with this method cannot be quantified, as the values are based on visual estimates. Rocks were then classified according to the International Union of Geological Sciences (IUGS) classification scheme (Streckeisen, 1973) using modal percentages.